The soccer star will travel to visit kids who are served by U.S.-based nonprofit Unbound. 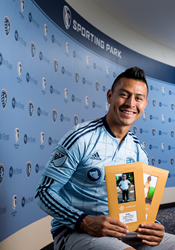 Roger Espinoza of Sporting Kansas City and volunteer partner with Unbound. Sporting Kansas City’s popular mid-fielder Roger Espinoza will travel to Santa Barbara, Honduras, Dec. 10, where he hopes to teach kids in his home country a little about soccer and a lot about life. Espinoza will spend several days teaching soccer skills to children sponsored through Unbound, visiting families in the program and encouraging kids to believe they have a promising future. Espinoza was born in Puerto Cortes, Honduras, and grew up in humble circumstances. He immigrated to the United States when he was 11 years old. Hondurans remember Espinoza as a star on the Honduran national football team and as a member of the Honduran soccer team in the 2012 Summer Olympics in London. Unbound is an international humanitarian organization serving more than 300,000 children and elderly in 20 countries around the world. Education is a cornerstone of the program. Espinoza will hold two days of soccer camps for 200 children and teens in the Unbound program. He will also visit some of the homes of the children who participate and have the opportunity to see how Unbound partners with families to provide personalized solutions to poverty. To schedule an interview with Espinoza, please contact Elizabeth Alex at 816-304-9498 or Erica Braker at EricaB(at)unbound(dot)org.